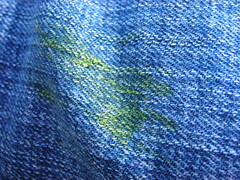 It’s spring and recent Easter egg hunts across Hampton Roads have reminded us of the infamous grass stain. Depending on your fabric, they can be very persistent stains that often, if left untreated, can damage clothes beyond repair. Attack the stains as soon as possible so that your playful spring attire last through the season. Start with a small amount of detergent if the stain is small; let the fabric soak in the warm soapy water and then rinse. For a larger, more stubborn grass stain use a small amount of white toothpaste and a sponge or soft brush to rub the stain out. Rinse to check on the stain. For those deep grass stains dilute rubbing alcohol with three parts water (one part alcohol). Soak the stain for 30 minutes or use a sponge on the stain. Let the fabric dry. Another great solution is a combination of baking soda and vinegar. Create a paste with the baking soda and water rubbing it on the stain. Add the vinegar, which will cause the products to fizz lifting the stain. Wipe the products off and repeat the process until the stain is removed. Do not use alcohol on wool or silk. Do not use alkalis, like ammonia, degreasers and alkaline detergents on grass stains. The combination between the grass stain and the alkalis can permanently set the stain in your fabrics. Do not use hydrogen peroxide; while many recommend it as a stain remover it is notorious for staining fabrics. Unless you’re extremely familiar with it as a stain remover, it may be best to avoid it. It is always best to get the stains removed from your garment as soon as possible. While it may seem extreme to strip the kids of their pants after play, it will ensure that your wardrobe money is not going to waste. For fabrics that must be dry-cleaned don’t hesitate to contact Mark Pressed4Time. We can pick-up and deliver dry-cleaning for free, saving you time and getting to those stains quickly. We know all about stains and would be happy to remove your stains in your garments.